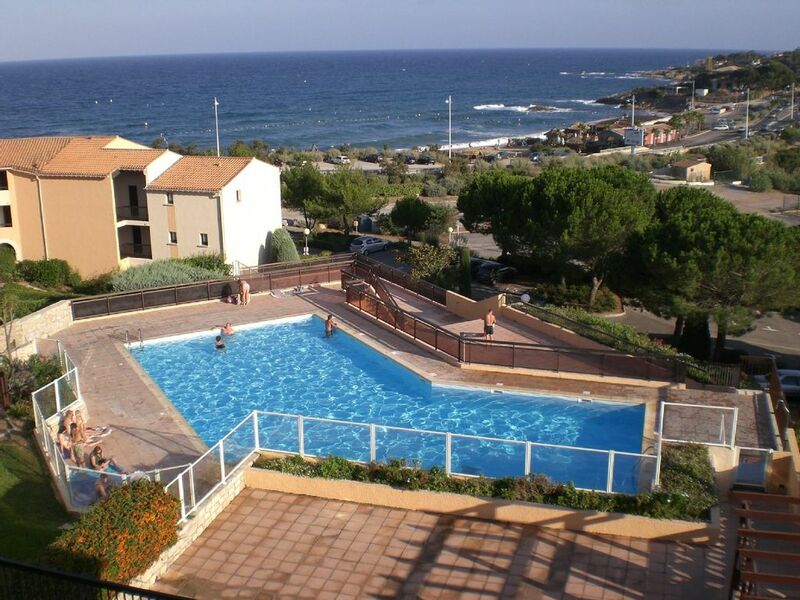 The apartment is within a Domaine at La Gaillarde with beautiful views over the sea. The sandy beach is about 150 metres away with a shop, restaurants and disco (weekends). There are tennis courts and a swimming pool (April to October) for residents next to the apartment. The accommodation is for six people in two bedrooms and a mezzanine. Description of Apartment: There is an entrance hall with cupboards. Two bedrooms, one with a double bed and the other has twin beds. The main living area has a small kitchen with microwave, cooking hobs and fridge. There is a bed settee and dining furniture. There is free wi-fi and the radio has an Ipod port. Above the kitchen area there is a mezzanine with a double bed. The bathroom has a bath, shower and hand basin and there is a separate toilet. There is a balcony with furniture. The car parking space is reserved. Rental includes free use of the tennis courts and the swimming pool. During July and August the beach has lifeguard surveillance. Blue Flag: 2003. For the third year running the beach at La Gaillarde has been awarded a 'Pavillon Bleu' - Blue Flag, for its cleanliness and contribution to the preservation of the environment. The rules have been made much tougher in recent years so this is quite a credit. This property is ideally placed for a family holiday with excellent facilities and views. The area has a wealth of sandy beaches and rocky coves. Apart from swimming there is plenty of scope for other activities such as cycling, walking and boat trips. At Les Issambres you can hire sailing boats such as Hobby Cats. For the family, Fréjus has many attractions including a large water park for the children and plenty of nightlife for the older ones. There is a large choice of shops including a ‘Géant’ super market. Boat trips are available from Fréjus to St Tropez and other destinations. Fréjus boasts a main line station, which can take you to all stops to Nice and also the Italian Riviera. A very convenient location and comfortable apartment. The booking and details were effectively managed and the deposit promptly returned. Enjoyed the beach (despite the rather cold water) and the coastal path. The national park almost backs onto the property and is a beautifully quiet area for walks, enjoy the woods, and the views from the hill tops. Take the ferry from St Maxime into St Tropez to avoid traffic. A very good visit and exploration of hilltop villages, the amazing Esterel coast, and the Gorges of Verdun. So glad that you were able to enjoy all the opportunities that this fascinating area has to offer. Perhaps the mistral gave you the opportunity to explore further due to the cold weather. We were disappointed and inconvenienced by problems with the apartment. Whilst we were forewarned about damage to the sink surround in the bathroom, that, and additional problems spoiled the overall apartment and our holiday. The sink surround was broken in several places and falling apart. It was clear that it had been repaired several times and should have been replaced long ago. The general condition of the bathroom was of a poor standard including loss of hot water in the basin. It needs a total renovation including air extraction. The washing machine was broken and was unusable during our stay and necessitated several trips to the launderette to wash the few towels that we brought in our suitcase. Note: no towels are provided. We had the inconvenience of tradesmen entering the property trying to make repairs during our first weeks holiday, the second week was spent working around the problems. These problems were avoidable and marred an otherwise very pleasant apartment which has great views and is very well situated. This was a most unfortunate series of breakages that all happened prior to the arrival of this visitor and we did our absolute utmost to get them repaired as fast as possible. These occupants were followed directly on from the family beforehand. We heard during the previous week that the washing machine had broken and a repair man came out immediately, reported a very minor problem, replaced the drive belt and left assuring us that it was fixed! We then heard that the basin was broken but could only warn the following people that it couldn’t be replaced prior to their stay and they were not keen to have workmen in during their holiday. We then heard that the hot tap didn’t work so immediately called a plumber who replaced it within 24 hours. Imagine our horror when we heard that the washing machine was still not working! All this within the first few days of this unfortunate couples holiday! This time we couldn’t get the same repair man immediately so called another who informed us that he couldn’t fix it as he couldn’t get the part for that model. By this time we decided that my husband had to be there to sort things out himself and he flew over and scoured the area for a new compact washing machine to no avail! He offered this couple a full weeks refund and £20 towards their laundry costs which we hoped would compensate them for the inconvenience. We moved in immediately they vacated the property and were able to replace the sink unit and fitted a new shower. It took us another week to take delivery of a suitable washing machine but we finally got it and it is now ready for next season. We have taken note of the lack of towels and they will be available from next year. We had stopped supplying them as it increases the cost but will now offer them to our visitors. We very much care about all our visitors and try to ensure that they have a trouble free holiday but this was a series of events beyond our control and it caused everyone concerned a great deal of stress. We loved this place - the view from the apartment makes the stairs worth it!! Everything you need for a great holiday is provided in the apartment.. Excellent location!! Mike is lucky we didn't decide to squat :) Beautifully clean! We always strive to make everyone's holiday a success and it gives us much pleasure when we have a satisfied guest. Thank you for your very positive review. The apartment is well located a short walk from a sandy beach with two beach bars, as well as a local shop and restaurants. Handy for exploring the southern Cote D'Azur, the well-kept apartment is in quiet development with good swimming pools. The view from the balcony out to sea was a joy every day. I would recommend hiring a car, as this helped us explore the coast from Port Grimaud to the Italian border and in land to the Haut Var. Les Issambres is a lovely town, very laid back and relaxed with good restaurants, bars and bistros. Saint Aygulf has more of a resort feel, with a range of shops including a bakery, post office and banks. The nearest hypermarket was in Frejus and worth a drive to stock up on food and drink at reasonable prices. We had an excellent holiday and would not hesitate to return. After reading the reviews about the apartment and Gaillarde beach, I had high expectations and they were exceeded in every way. The apartment was delightful, and as other reviewers have stated, contained absolutely everything you could possible want, even down to mats and shades for the beach. It also does not have a TV – heaven! Mike was extremely helpful during the booking process; a pleasure to deal with. We ate at the apartment most nights after shopping at Le Geant in Frejus. A wonderful supermarket, with a huge range of quality food and drink at really good prices. We sat at the table on the apartment balcony sipping our chilled Rose, looking over the pool and beach, watching the world go by. The sea was blue, clean and warm and less than a five minute stroll away. The ice cream sellers handsome, amusing and constantly chased by love-stricken young girls. Be careful where you sit. On the first day we were lying above the high water mark when we were attacked by a roller from Hell. The wave broke 8 feet further up the beach than it had before or since. We, our towels, clothes, books, camera and Kindle were all washed away. After that we sat further in shore but it never happened again (we were hoping to laugh cruelly at other people as had been done to us). We had a drink at Le Windy one night, but the service was so abysmal we never went back. We had a lunch and dinner at La Ferniente on the beach where the food was excellent and not as pricey as I feared. We did not try the restaurant next to Le Caveau as the menu was quite limited and expensive. The shop next to Le Windy is not just a beach shop, it also sells food, drink and English newspapers, ideal if you run out of something and don’t want to drive to Le Geant. Speaking of Le Windy again. For the masochists amongst you they have a music night twice a week where you can be entertained by middle-aged singers sharing their old French classics; forgettable and unforgettable at the same time. I heartily recommend this apartment. I would consider this the best holiday I have had (excluding my honeymoon, obviously, wife dearest). The only slight quibble I could make is that washing machine instructions are in every known language except English. It was a constant fear that everything would come out pink! We are delighted that you enjoyed your stay in our apartment in spite of the mini tsunami! We have resisted putting in a TV and pleased that you agree that it is nice to have a break from the box. Besides there is wifi if you are desperate for information about the outside world. The washing machine, bought in France, does have instructions in English hidden amongst all the other languages as is often the case with French appliances but we will look out for you all in pink! For many years Le Windy restaurant has been a favourite with our guests but like most restaurants on the coast, the management changes annually and this year they do not seem so good. We too had poor service when we had a meal at Le Windy when we stayed in June. However, it is still good for the take away pizzas. Fortunately there are other restaurants and Plage Farniente (http://www.plagesmed.fr/annonces/restaurant-les-issambres.html) is owned by Julia and Eric who do an excellent job providing lovely food in beautiful surroundings on the beach. We look forward to hearing from you in the future perhaps. Mike and Vicky. La Gaillarde is situated between Les Issambres and St Aygulf approximately 15 minutes from the Roman town of Fréjus and about half an hour (traffic permitting) from St Tropez. Nice airport is about 35 minutes from the apartment by car. The beach is sandy and patrolled by Sapeurs Pompiers lifeguards during the high season. About an hour’s drive inland is the Gorge de Verdun which is spectacular and pedal boats can hired to explore the Gorge and Lac St Croix. The price includes bed linen, sheets and pillowcases. There are no other extra charges. Payments can be accepted using PayPal but please add 2.5% to cover PayPal charges. A refundable deposit of £150 is required against damage. The apartment has a telephone. Wifi is included in the price. There is a washing machine and a fridge/freezer.